The Triumph Tiger range was introduced by Edward Turner following his installation as Chief Designer and General Manager at Triumph Engineering. 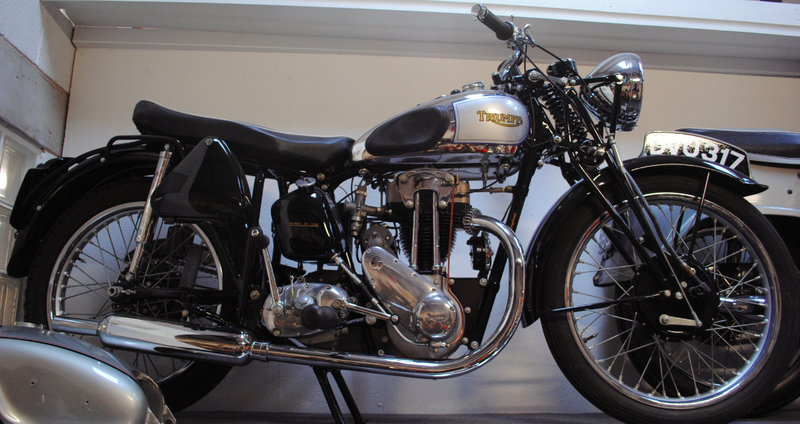 The motorcycle producing arm of Triumph hadn’t been performing well in the early 1930’s and was sold off in 1936 to JY Sangster of Ariel. Valentine Page was a British motorcycle designer who worked for several of the UK’s leading marques, including Ariel, Triumph, and BSA. Edward Turner took Page’s range of 2/1, 3/1 and 5/1 (250, 350 and 500cc single cylinders) adding chrome petrol tanks, upswept exhausts and polished crankcases, and gave them Tiger 70, 80 and 90 models names relating to their top. This particular model above is on display at Lakeland Motor Museum and was bought new in October 1937 by Sydney Waterfield of Manchester. He used the motorcycle extensively for commuting as well as pleasure trips including visits to the Isle of Man TT, Silverstone and other race circuits. After WWII, rear suspension became popular on new motorcycles and the bike was converted from the original rigid rear end to a swing-arm and dual seat. It is believed that this is a McCandless design, produced under license by Feridax, who still produce motorcycling accessories and clothing. Continuing to use the motorcycle throughout the 1960’s and 1970’s, Mr Waterfield made a note of all maintenance work undertaken. He had a second engine which he refurbished and swapped over every summer. Upon his retirement in 1980, it remained untouched in his garage until his death in 1999. His family arranged its restoration to the fantastic condition seen today.